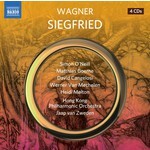 This is the third and penultimate release in the acclaimed cycle of Wagner's Der Ring des Nibelungen with the Hong Kong Philharmonic conducted by Jaap van Zweden. Of the star cast for Siegfried, Matthias Goerne has been singled out for particular praise by the critics, with Gramophone stating that he "sings Wotan beautifully, with much baritonal sophistication, predictable (from an experienced Lieder recitalist) care for words and able negotiation of trickier moments." Opera News wrote "Matthias Goerne is a revelation... [he] upholds the great tradition of Wagner singing." Each member of this carefully selected cast has an established reputation in opera performance, and most are known for significant and highly demanding Wagnerian roles. These include tenor Simon O'Neill as Siegfried, one of the finest heldentenors on the international stage, and soprano Heidi Melton as Brünnhilde, who has been called "the Wagnerian voice we have been waiting for since Flagstad and Nilsson" (La Presse).